Forests: We’re investigating landscapes of dynamic forest change, in forests consisting of (depending on the case) rich natural forest, commercial plantations, invasive species, and agroforestry. The case studies are as diverse as the student’s origins: Vietnam, Chile, Ghana, and France. Nguyen Hai Van seeks to trace how a multitude of policies and projects affect forest transformations and local livelihoods in the periphery of the Sao La Nature Reserve in central Vietnam. Van’s thesis will contribute to the “FT Việt” project. Most recent arrival Astrid Oppliger will investigate the nexus of science, policy, and governance in the establishment of a major new forestry policy in the commercial plantations of southern Chile. David Amuzu is heading back home this summer to begin investigating how sustainable cocoa production programs lead to landscape and livelihood transformations in the cocoa agroforests of southwest Ghana. Last but not least, as an honorary and distant member of the group, Zoé Ginter (who I am helping to co-supervise at the University of Bordeaux Montaigne) is working on a project investigating the social debates and dynamics around invasive but appreciated black locust (Robinia pseudoacacia) forests in western France. Food commodities (tuna, sheep, cocoa): I’ve already mentioned David’s work on the cocoa commodity chain in Ghana above. 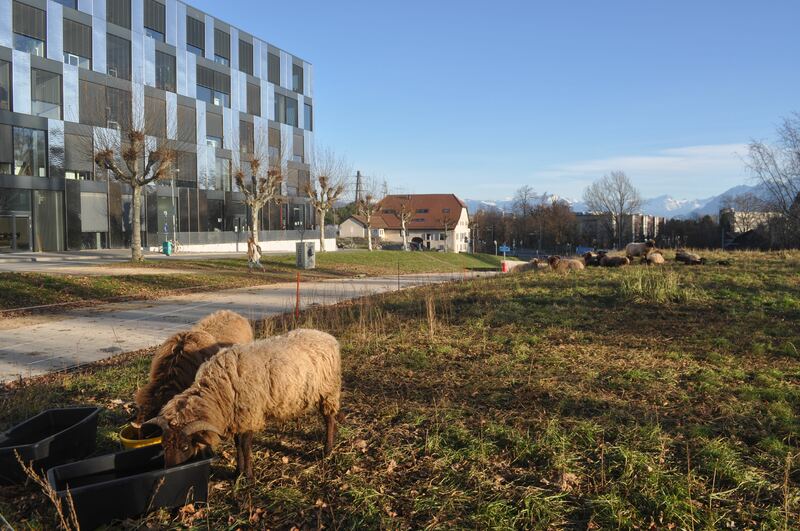 Hélène Weber is investigating sheep raising in western Switzerland, dissecting how the sheep sector is structured, how the biology of sheep affects production and marketing options, and the role of ideas and representations in how sheep farmers mould their activities. Mialy Andriamahefazafy has undertaken fieldwork in Mauritius, Seychelles, and Madagascar on tuna fishing. She investigates how technology, discourses, materiality, and spatiality affect the governance and access to this moving resource at multiple scales, and the potential catalyst of tuna governance for a western Indian Ocean regional identity. Rivers and hydrology: The venerated Ganges River of India is the subject of Flore Lafaye de Micheaux‘s studies, which seek to make sense of how the river-as-deity, national-level politics, and local resource conflicts come together in shaping policy and activism on the river. She uses this case as a launchpad to contribute to theory, moving the ‘hydro-social cycle’ beyond water and exploring the missing cultural elements of political ecology through geo-philosopher Augustin Berque. She is joined in the water theme by the work of Van in Vietnam and especially Astrid in Chile, mentioned above. In both their cases, forest governance is linked to hydrology. In Vietnam, a newish ‘PFES’ policy pays landholders for maintaining forest cover in hydropower and drinking water reservoir catchments. In Chile, debates over forest-hydrology relationships are central to new forestry policies. You can see the team’s faces and contact information on the site of the “Development, Societies, and Environment” research group within the Institute of Geography and Sustainability. This entry was posted on Friday, May 25th, 2018 at 7:33 am and is filed under Political ecology, Research, Teaching. You can follow any responses to this entry through the RSS 2.0 feed. You can leave a response, or trackback from your own site.